The road to the Olympics isn’t cheap, and if you’re an amateur athlete in a lesser-publicized sport—even a world-class competitor—it can be prohibitive. 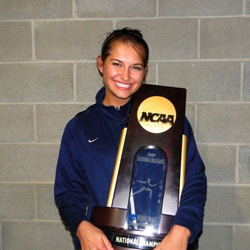 For Monica Aksamit ’12, the 2012 NCAA fencing runner-up and a three-time All-American during her collegiate career, the road to the 2016 Summer Games in Rio goes through qualifying competitions all over the world. The more she enters, the more points she earns toward her overall ranking. The price tag is steep: Last year alone, she says, travel to international and domestic events topped $13,000. With minimal funding in this sport, the purpose of this campaign is to assist in the costs of properly training on my Road to Rio. Like many professional athletes are paid to do their jobs, this is not the case with fencing and I need to give 100% focus to bettering myself in pursuit of the Olympics on a daily basis! Aksamit has relied mostly on social media and the help of friends acting as her personal sports information department to get the word out. She eventually plans to reach out to other organizations, including local political officials, women’s groups, and fellow fencing members across the country. “I have a relatively set game plan,” she says. Entry filed under: Uncategorized. Tags: 2016 Olympics, Fencing, Monica Aksamit.